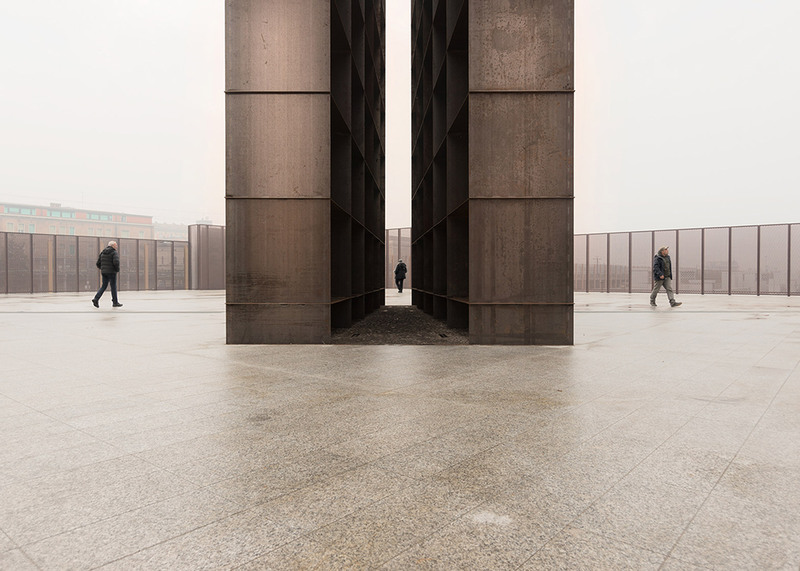 The space at the heart of this rusting steel memorial narrows to a width of just 80 centimetres, designed to make visitors empathise with the "feeling of oppression" experienced by Holocaust victims (+ slideshow). 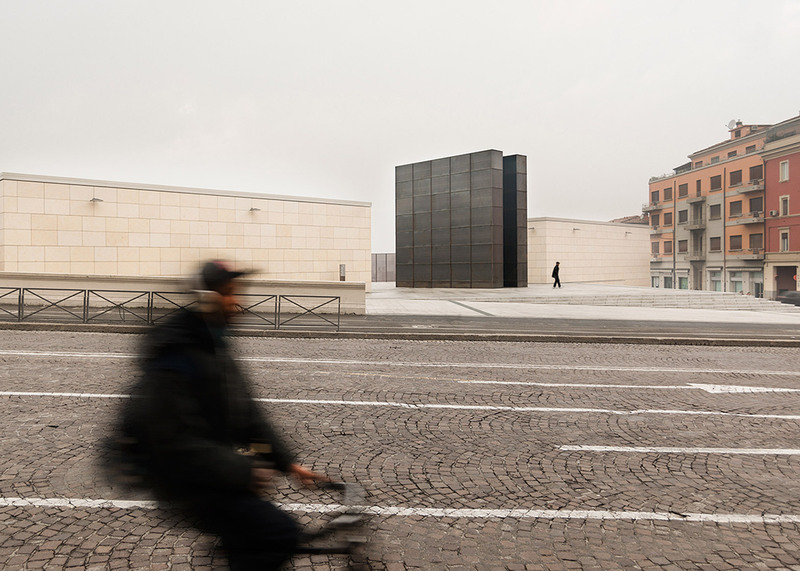 Designed by Rome-based office SET Architects, the Bologna Shoah Memorial is located on a city square in Bologna, Italy, close to the newly installed high-speed train station. The structure is made up of two symmetrical steel blocks, each measuring 10 by 10 metres. The blocks sit adjacent to one another, with their positions converging to create a path that begins with a width of 160 centimetres, before drastically narrowing to just 80 centimetres. The architects chose a type of Corten steel that is only slightly rusty at the moment, but will naturally continue to oxidise and become an orange colour over time when exposed to open air. They claim it will "display the vestiges of time" as it corrodes. On the inside of the memorial, a grid of horizontal and vertical metal sheets intersect to create rectangular openings, described by the architects as boxes. "The memorial is a recognisable landmark of great emotional power," said the architects. "It attracts passersby, inviting them to reflect on the tragedy of the Holocaust." "The path generates an immediate feeling of oppression, and the empty boxes represent the cells of the dormitories in the concentration camps," they added. The path between the two blocks is paved in ballast – a surface of basalt stone chippings more commonly used to form the bed of a railway track or road. The aim was to represent the Judenrampe – the name given to the trek that prisoners made between the first and second concentration camps at Auschwitz. 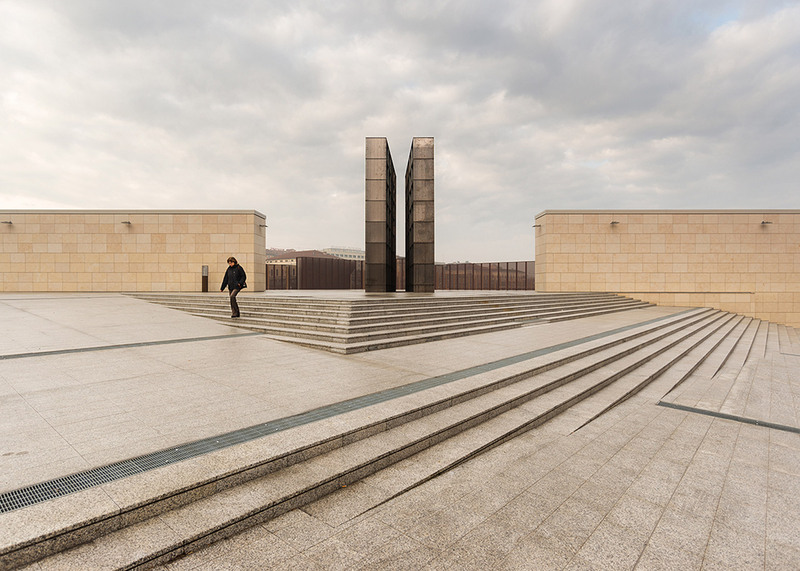 "The empty echoes of footsteps across the stones coupled with the restriction of the passage instills a keen sense of anguish: in this way the memorial takes on life and evokes the drama of the memory," added the architects. During the day, the passage is dimly lit by daylight filtering in. But at night, lamps placed alongside the interior path illuminate the gridded volumes. Architects have created a number of Holocaust memorials around the world. Perhaps the most famous is Peter Eisenman's Memorial to the Murdered Jews of Europe in Berlin, but other examples include a glass-enclosed former home of an SS commander at Nazi concentration camp in the Netherlands, and Daniel Libeskind's National Holocaust Monument in Canada – which is currently underway.